I finally got on the stuffed zucchini train and made these vegan zucchini boats. You can never have too many zucchini recipes right? Especially when they are healthy zucchini recipes. These vegan zucchini boats are super easy to make and only contain simple ingredients that you already have in your house. I love recipes like that, don’t you? Some foods are really hard to photograph. This is one of them. Even though the picture isn’t great, I promise the recipes is delicious. I am slightly obsessed with sun-dried tomatoes these days. In my opinion, the sun-dried tomatoes are what really makes this recipe delicious. Every other bite you get the sweetness of the tomatoes. It pairs very well with the onions and garlic. Since I made this recipe with quinoa, it can be a complete vegan meal. Put the sun-dried tomatoes in a bowl with enough water to cover them. Soak for 30 minutes. Once they are done soaking, drain the water and dice them. Cut the zucchini lengthwise and scoop out the flesh to create the boat. Put the flesh on a cutting board and dice. In a large saute pan , on medium heat, add the olive oil, shallot and garlic. Cover and let cook a couple minutes. Stirring a couple times. Add the zucchini flesh, sun dried tomatoes, mushrooms, quinoa, balsamic vinegar and salt to the saute pan and let everything cook for another couple minutes. Place the zucchini boats on a lined baking sheet. Brush them with oil and then fill them with the mixture from the saute pan. Place the boats in the oven and cook for 30 minutes, or until the zucchini is tender. These are best eaten right away. Store them in an airtight container. They should last a week in the fridge. Enjoy! Hi Melissa- I love your recipes. thanks for sharing! I nominated you for the Very Inspiring Blogger Award. http://www.healthyrunningmom.com/2014/08/03/the-very-inspiring-blogger-award/. These were amazing! Had them for dinner tonight ... so simple, such great flavor.. thank you! Thank you!! Glad you enjoyed them. Thanks for catching that! Add them at the same time you add the mushrooms. Just made these and they were absolutely fabulous! I LOVE vegan meals that don't make you feel like there is something missing, and this is one of them! Yay! So happy to hear that Rachel! These were wonderful. I was out of mushrooms, so I added spinach. Thanks Rose! So glad you enjoyed them! 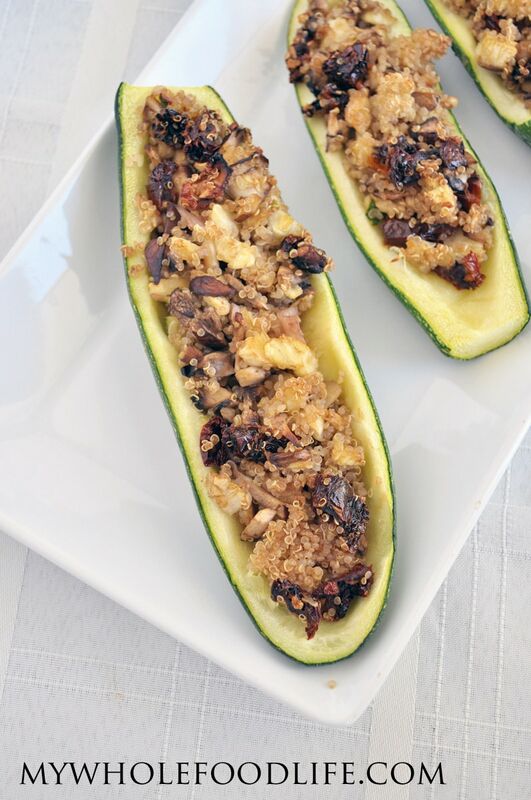 I love zucchini and these look great and really easy..just my style!